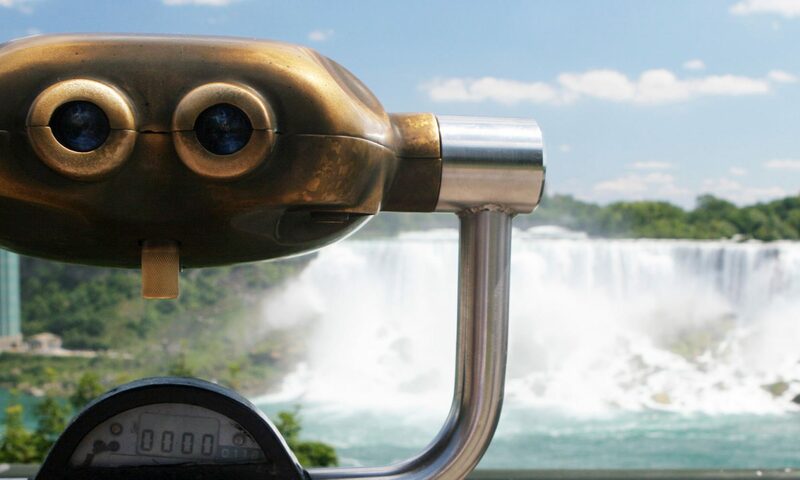 In January of 1886, the Niagara Falls and Whirlpool Company was formed in order to build a new railway from Prospect Point to the area north of the Whirlpool. The plan was to build a narrow rail line along the American shoreline at the base of the Niagara Gorge slightly above the river. The railroad bed was designed to be only 3 metres wide, which is roughly the same size as the distance between the rail tracks. Before construction could begin, the company went bankrupt and the project died. Two Buffalo businessmen Captain George M. Brinker and George A. Ricker reorganized the Niagara Falls and Whirlpool Company and renamed it the Niagara Falls and Lewiston Railroad. This company had expanded the original railroad plan and wanted to extend it from the Niagara Falls to Lewiston. The distance of the railroad, once complete would be 11.3 kilometres (7 miles). From the total distance only 213 metres (700 feet) was evenly level ground, while the remaining portion of the path was either curved or changed elevation with the steepest being 9%. Hence, the newly proposed railroad became one of the most expensive as well as the most difficult railway ever constructed. The first phase was the laying of a single track. The rail bed was constructed in 75 days. During the first half mile, roughly 91,000 cubic metres of rock were blasted from the area and thrown into the Niagara River. The construction, which started April 11th 1895, ceased upon the completion of the Niagara Falls and Lewiston Railroad and opened on August 25th 1895. This electric railroad became an instant marvel of engineering technology. This attraction was competing with the attraction of the Niagara Falls. The Niagara Falls and Lewiston Railroad service provided the public with a remarkable view of the mighty Niagara River including the colossal waves of the raging Whirlpool Rapids. The public’s acceptance of such a unique and exhilarating experience only accelerated the laying of a second track. In order to improve service, the Great Gorge Route purchased additional land in Lewiston with the sole purpose of providing passengers with easy connections from the trolleys to the New York Central Railway and Lake Steamers. From 1811 to 1963 Lewiston had become the main Port of Entry into Niagara and its surrounding area. Lewiston had become a transportation center and enjoyed a resurgence of economic development. With the Great Gorge Route brought passenger steamers from Toronto, Montreal and other major cities to Lewiston. This helped out the attraction of the Falls as tourists had direct connections from this docking area. The second track was completed in 1896 and now the Niagara Falls and Lewiston Railroad operated cars in both directions at the same time with greater frequency. With the success of the new railway on the American side, the Queen Victoria Niagara Falls Park Commission in Canada was in desperate need of money and visitors. Without a transportation link from Queenston, which is opposite to Lewiston, the Parks Commission were unable to attract the volume of tourists and money that their counterparts on the American side were able to. Any monies being generated at that time wasn’t sufficient to meeting the operating expenditures. Improvements were needed to make it easier for people to get to the park, not only from Queenston. The main train station in the City of Niagara Falls was 3.2 kilometres away from Queen Victoria Park. The Canadian sites were not being visited because there wasn’t any direct transportation to the Falls. The Commissioner’s believed that an electric railway running from Queenston to Queen Victoria Park would provide the necessary transportation link of getting to the Canadian side of the Falls. It was hoped that when this link was established that some of the steam boat passenger services from Lewiston would be attracted to the Canadian side. On December 4th 1891, the Queen Victoria Niagara Falls Park Commissioners signed an agreement granting a railroad franchise to E.B. Osler of Toronto and R.B. Angus to build and operate the “Niagara Falls Park & River Railroad Company”. This railway ran from Queenston to Chippawa and the contract allowed them to develop hydro electricity to power the railway. For this franchise, the Niagara Falls Park & River Railroad agreed to pay the Parks Commission $10,000 per year over the span of a forty year contract. Construction on the railway began in 1892, however early in the construction, engineers realized they had voltage problems at the Queenston end of the line. The company’s powerhouse, located at Table Rock, generated direct current at 600-660 volts. This level of voltage would not be enough to reach Queenston. To solve this problem, the Niagara Falls Park & River Railway built a steam driven electric power generator south of the Queenston docks. On May 24th 1893, this new railway, featuring a single rail line, was open to the public. The rail line was very successful as The Niagara Falls Park & River Railroad Company carried approximately 354,000 people during its inaugural season. In 1894, the Niagara Falls Park & River Railway expanded to two tracks along most portions of the route to quicken the transportation. In 1895, the track was also extended 2.4 kilometres south of Chippawa to Slater’s Dock (opposite north end of Navy Island). This allowed for passenger steam ships from Buffalo and other Upper Great Lake cities to use this new railway system. The first trolley cars for the Niagara Falls Park & River Railway were built by the Patterson and Corbin Company of St. Catharines. The rail cars were at most 8.5 metres in length, featuring open sides in order to provide easy access and spectacular observation for all the passengers. Later, trolley cars were built in house at their shop located just south of the Spanish Aero Car. By 1896, the railway carried approximately 499,015 people and had generated a healthy profit despite high expansion costs. In 1899, Captain John Brinker claimed that the Niagara Falls and Lewiston Railroad had cost him $800,000, and from this high cost, he could no longer afford to continue operation. In order to resume the train services, during the summer of 1899, Brinker sold the railroad to General Francis V. Greene and Herbert P. Bissell. The railroad became the known as the “Niagara Gorge Railroad Company”. In 1902, the Canadian “Niagara Falls Park & River Railway” was sold to the American Niagara Gorge Railroad Company. The Canadian route was linked to the pre-existing Niagara Falls and Lewiston Electric Railway. The two rail lines were connected at the Queenston – Lewiston Suspension Bridge and the Upper Steel Arch Bridge (Honeymoon Bridge) to begin a new international service. The two merged railroads became known as the “Great Gorge Route” or “Niagara Belt Line”. The new company formed was called the International Railway Company. Electric Trolleys carried patrons along this six mile long looped belt line. The cost of each trip was $1.00 and patrons could board at any point along the loop. The loop began on the Canadian side of the Upper Steel Arch Bridge. The rail line then followed a route on the top edge of the gorge past the splendour of the American Falls to the Table Rock located at the Horseshoe Falls. Here the tracks made a 180° turn and returned to the Upper Steel Arch Bridge by passing through Queen Victoria Niagara Falls Park and past the Clifton Hotel. The railway loop followed the top edge of the Niagara Gorge to where the rail line crossed into Lewiston, New York via the Queenston-Lewiston Suspension Bridge. From Lewiston, the railway ran in a southerly direction toward the base of the gorge only feet above the torrent of the Niagara River. The Great Gorge Route was the only service available at the time that provided patrons with the most magnificent view of the Niagara River, the Whirlpool Rapids, the Whirlpool and the majestic Niagara Falls. Open sided trolleys were used in the summer. The seats went completely across the width of the trolley. Access to the trolley was gained by using a running board which ran along the length of each side of the car. The sides of the trolley had window type blinds which could be pulled down by the rider to shade themselves from the sun, if it rained or became too cool. After five years of operation, the Great Gorge Route was running trolley cars through the gorge in fifteen minute interval, from 7 a.m. to midnight, seven days a week. The Great Gorge route closed seasonally between March 1st and April 30th during the spring thaw, which was when most rock falls occurred. During each year, the Great Gorge Route was carrying an average of 200,000 passengers. Erosion of walls of the Niagara Gorge became the biggest enemy of the railroad. The Great Gorge Route was being disrupted by rock falls and landslides, as they were a costly expenditure requiring regular repairs and preventative maintenance. It wasn’t long before these repair expenditures soon began to eliminate any profit. Amazingly, in the first forty years of operation and carrying thirteen million passengers, not one car, passenger or employee was ever struck by a falling rock. On September 6th 1901, United States President, William McKinley with his wife and his entourage rode on the Great Gorge Route. In 1914, spotlights were added to illuminate the Whirlpool Rapids at night. Accidents over the years plagued the Great Gorge Route’s operation. On March 12th 1907, an avalanche of ice just north of the Whirlpool Bridge killed a conductor and eight passengers. In 1910, two trolley cars crashed head-on at the upper end of the Whirlpool Rapids causing the cars to derail, which lead to the injuries to two passengers. This accident occurred at a single track trestle at Swift Drift located near the Whirlpool Rapids. In 1913, a garbage chute, located under the rail bed of the Great Gorge Route at the north end of Niagara Falls, exploded showering passengers in a passing trolley with tons of semi liquid sewage. On July 15th 1915, a trolley car carrying a Sunday School group from Toronto was travelling down the escarpment along the Canadian shore at Queenston. 157 people crowded onto the 84 passenger Trolley # 685 for the ride down the escarpment to the Queenston Docks. The extra weight sent the trolley down the escarpment fast than normal and due to the heavy rain, when the motorman applied the brakes they didn’t work. As the trolley reached a sharp curve at the base of the escarpment near the river, the trolley derailed and crashed into a tree. The trolley motorman and the general manager were arrested for “slack observance of rules”. The cause of this accident was attributed to a broken brake rod. Thirteen persons were killed, 60 – 70 people were injured and eleven were in serious condition. On July 1st 1917, 12 tourists died while another 24 tourists were injured when a trolley filled with passengers derailed and plunged into the Niagara River at the Whirlpool Rapids just below the Whirlpool Bridge. The cause of this tragic accident was as a result of heavy rains. The trolley rolled down a thirty foot embankment and came to a short rest upside-down on several submerged rocks before rolling on to its side and into the raging river. To make matters worse, a customs officer had alerted the staff of the Great Gorge Route of the unstable rail-bed approximately thirty minutes before this accident and the trolleys were not stopped. Every day following this accident, Great Gorge Route rail inspectors rode the belt line to ensure safety before the line was open to members of the public. In the latter part of February 1930, a small rock slide crashed down on the rail bed carrying it and a number of power poles into the river. The Canadian portion of the International Railway Company’s “Great Gorge Route” continued until September 10th 1932. It was at this point when the line was abandoned. The International Railway Company refused to renew its charter with the Niagara Falls Queen Victoria Parks Commission officially terminating the Canadian portion of the Great Gorge Route and the Niagara Belt Link. On September 17th 1935 at 2 a.m., five thousand tons of rock fell approximately 150 feet north of the Whirlpool Bridge, destroying more than 200 feet of track and rail bed. This was that largest rock fall to plague the Great Gorge Route. It forced the Great Gorge Route to close for business. The Great Gorge Route line along the base of the Niagara Gorge on the American side was never repaired and was never reopened. Today, only few remnants of the former Great Gorge Route can be found at the base of the Niagara Gorge along the American shoreline. Portions of the former rail bed and brick supports are all that are visible today. For the most part, nature trails along the former rail bed of the Great Gorge Route are all that remain of a great engineering marvel in Niagara Falls. The nature trails along the former Great Gorge Route provides some of the most magnificent and breathtaking views of the Niagara River and Niagara Gorge.